LAWRENCE — The Brazilian state of Mato Grosso produces enough soybeans to be the equivalent of Iowa and Illinois put together. But it also plays home to lush Amazon rainforest, one of the richest, and most vulnerable, ecological treasures on our planet. Using satellite imagery and unique ground-based information, the interface between highly mechanized agriculture and rainforest in Mato Grosso is shown with exceptionally granular detail in a new study led by Jude Kastens, research associate professor at the Kansas Applied Remote Sensing Program of the Kansas Biological Survey, and co-authored by J. Christopher Brown, professor of geography and atmospheric science and director of the Environmental Studies Program at the University of Kansas. Their paper appears April 28 in PLOS ONE. Indeed, the researchers said agriculture in the area has a boom-town energy, generating billions of dollars annually that contribute to the state’s economy. However, agricultural expansion has come at the expense of the Amazon rainforest. Concerns over widespread deforestation in the area led to a 2006 agreement between environmental groups and large agricultural corporations called the “Soy Moratorium.” Under the moratorium, major soy purchasers agreed to not buy soy produced on land deforested after July of that year. Kastens and Brown, along with KU colleague Christopher Bishop and Alexandre Coutinho and Júlio Esquerdo of the Brazilian Agricultural Research Corporation (Embrapa), relied in part on satellite datasets from the Moderate Resolution Imaging Spectroradiometer, or MODIS. By looking at images taken over 14 growing seasons, the researchers could examine changes in cropland location and production intensity across Mato Grosso. Most soy production in the Amazon Forest Biome occurs in this large state. To interpret the satellite data, co-authors from Embrapa, the Brazilian equivalent of the USDA, collected an unprecedented amount of ground reference data in Mato Grosso by interviewing farmers. In 2006, the KU and Brazilian researchers began working under a memorandum of understanding to share methods in ground data collection and land cover classification. Since then, the researchers have visited each other’s labs and carried out field work together. A major finding of the research suggests the 2006 Soy Moratorium had a larger effect in reducing deforestation in the Amazon than has been previously understood. “Based on our analysis, we found a much stronger deforestation decline coincident with the Soy Moratorium than other studies have reported,” Kastens said. “The Soy Moratorium has been downplayed in some research as a factor in deforestation reduction. Our examination of essentially the same deforestation dataset used by others revealed a major decline in deforestation occurred immediately after the moratorium took effect. “Deforestation is still happening, but it has slowed, and less of this land is being used for soy production,” Kastens said. The study incorporated deforestation data produced by the Brazilian Institute for Space Research (INPE). The team also found a sharp rise in production on existing cropland after the moratorium, dubbed “vertical intensification,” while deforestation-driven cropland expansion, or “horizontal intensification,” slowed substantially. “With vertical intensification, we see a dramatic increase in double cropping, where farmers plant a first crop of soybeans followed by a second commercial crop, typically corn, in the same growing season and field,” Brown said. The researchers are making their land cover data freely available. They hope it will help guide land managers and policymakers looking to strike a balance between farming and conservation. The Amazon is also home to many native populations. “Indigenous people in rain forest reserves are being completely surrounded by these soybean fields, many of which are upstream,” Brown said. Images: 1. Study area (Mato Grosso). 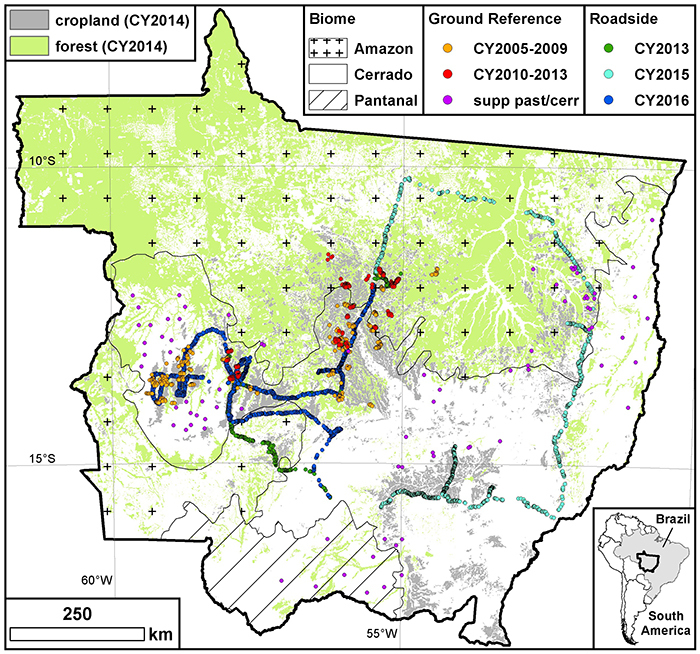 Forest and cropland geography as of crop year 2014 are shown along with biome boundaries and the locations of the ground reference and roadside data points. 2. Mato Grosso land cover for crop years 2001 and 2014. Final land-cover maps are shown for crop years 2001 and CY2014. Biome boundaries, which are overlaid on the land-cover maps, are labeled on the inset map. Protected areas (indigenous reserves) are also shown on the land-cover maps. 3. Map area totals for deforest and soy. 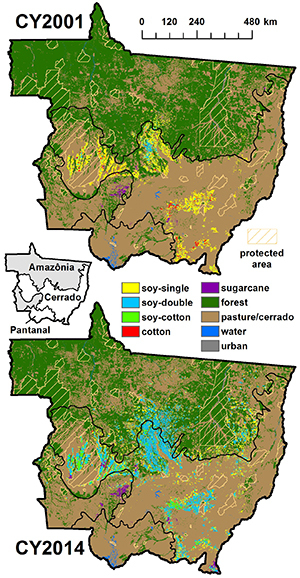 Map-based areal data summaries for accumulated deforestation and annual soybeans are shown. 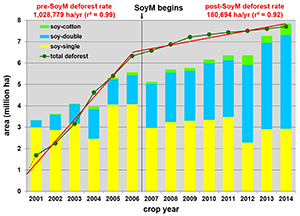 Pre-soy moratorium and post-soy moratorium deforest trend lines are also depicted, with respective regression slopes provided in red text above the graph. A value of 0 was assigned to crop year 2000 to anchor the pre-soy moratorium total deforest trend line in the same manner that crop year 2006 is used to anchor the post-soy moratorium total deforest trend line.